Skibbereen Theatre Society will be bringing their acclaimed production of The Quiet Moment by Limerick playwright Mike Finn back to Skibbereen Town Hall for two nights only this weekend ahead of their appearance at the All-Ireland Confined Drama Finals in Castleblaney, Co Monaghan, on Monday next. Having enjoyed a very successful run on the on the amateur drama festival circuit during the past month, the group qualified for the All-Ireland with three wins, two seconds and two third placings. They also won an array of acting, directing and production awards at the various festivals from Scarriff to Kildare and Mountmellick to Rossmore. The cast includes Mary O’Driscoll, Fachtna O’Driscoll, Declan McCarthy and Gerry Minihane, directed by Hilda Hegarty, with Catherine Field as assistant director. The stage and production crew includes Barthy Connolly, Gearóid MacEoin, Fachtna Hamilton, Charlie and David Keohane and Gearóid McCarthy. The Quiet Moment will be performed at Skibbereen Town Hall this Friday and Saturday, April 15th and 16th, nightly at 8pm. Tickets are available in advance from Thornhill Electrical, tel 028-22557, or at the venue from 7.30pm on show nights. Their All-Ireland performance will be on Monday next, April 18th, at the Iontas Theatre in Castleblaney and the adjudicator for the finals in Anna Walker. Having seen the nine groups perform, she will announce the winner and the various awards on Saturday 23rd. 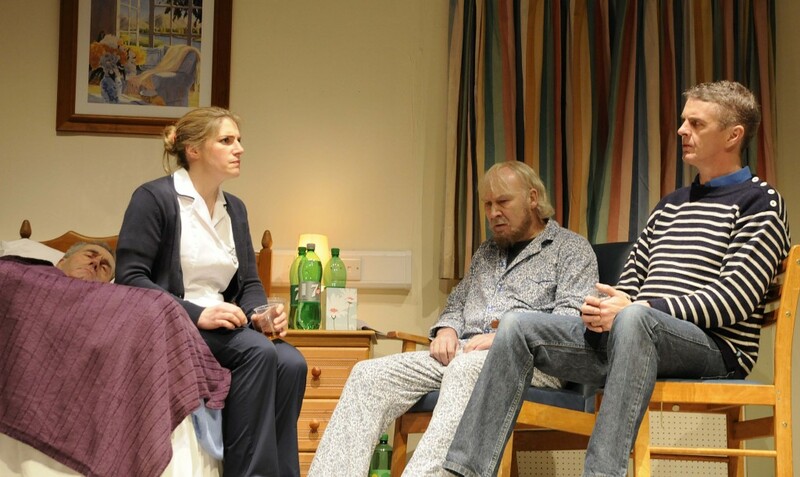 The cast of the Skibbereen Theatre Society production of ‘The Quiet Moment’ in pensive mood in a scene from the play by Mike Finn – from left – Fachtna O’Driscoll, Mary O’Driscoll, Gerry Minihane and Declan McCarthy.